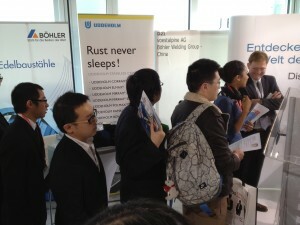 The SinoJobs Career Days were held in Düsseldorf and Munich on November 6 and 8 for the third consecutive year. The voestalpine Group was also present with a stand at the fair. Germany’s leading recruitment fair with a focus on China offers many companies from Europe and Greater China the opportunity to present themselves as attractive employers. It enabled Chinese graduates, students, and professionals, either wishing to return to China or to find attractive employment in Germany or Austria, to forge personal contacts. This year, the event was aimed at visitors with an academic background in engineering or economics. voestalpine welcomed numerous visitors to its stand on both days, all primarily interested in internships and job opportunities in China, Germany, and Austria. Employees of voestalpine AG, Böhler Welding Technology (China) Co., Ltd., and BÖHLER-UDDEHOLM DEUTSCHLAND were present at the stand to familiarize visitors with the diverse nature of the voestalpine Group, with its 500 Group companies and sites in over 50 countries, and to cover as many subject areas as possible. The 2020 voestalpine Group strategy is characterized by strong internationalization efforts focusing on increased growth in both North America and Asia. voestalpine currently operates 64 companies and locations in Asia with a total of 3,600 employees (including joint ventures). Six percent of the most recent corporate sales were achieved in Asia, corresponding to roughly 700 million euros.